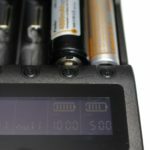 Zanflare is now into battery chargers! 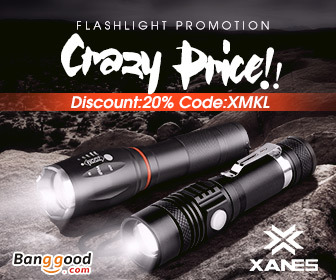 So let’s have a look at the Zanflare C4 and see if it has as much quality as their flashlights do. 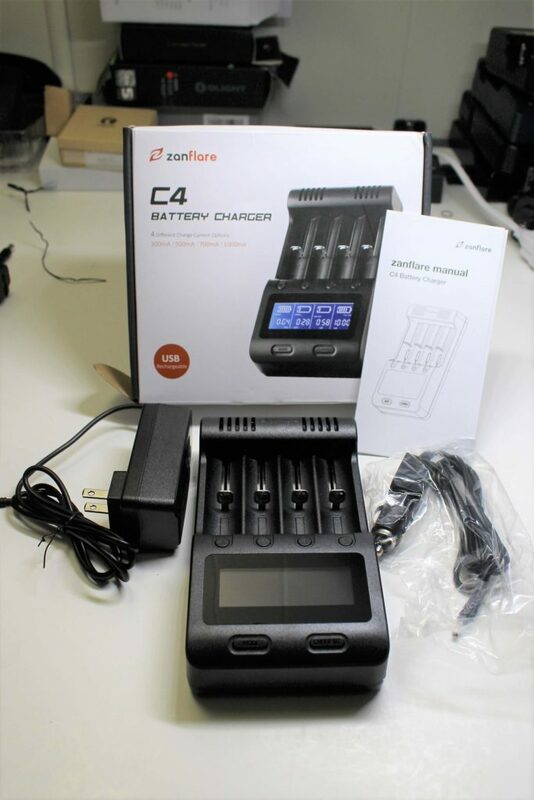 From the photo, you can see that the C4 package includes a user manual, an adapter to use in the car, and a standard 12v AC adapter. Measuring the unit, it comes out at four inches wide, and seven inches long. For weight, a reasonably lean nine ounces. It has a USB output port which can be used as a power bank. 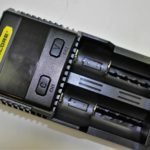 This is a 5v port, and the amperage of either 1A or 2A depends on how many 18650 batteries are in the charger at once. 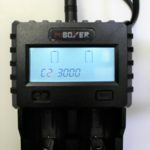 Each slot works independently of the others, and can be set to different functions and charging values. 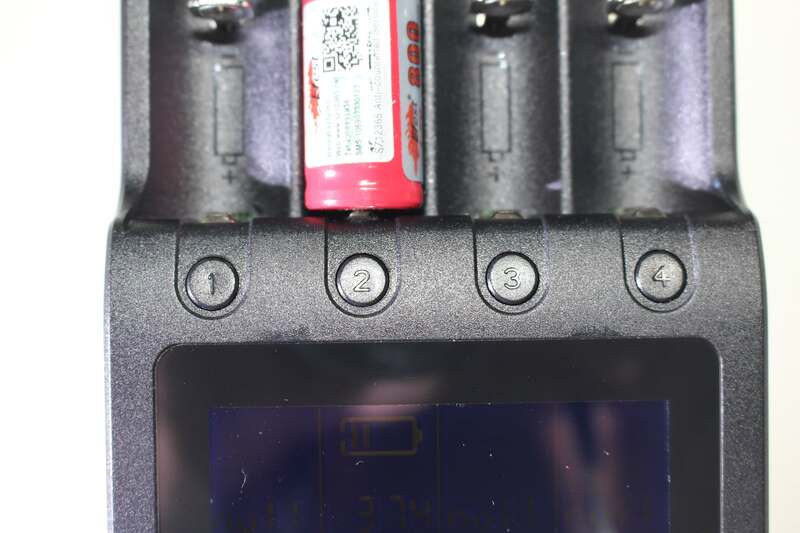 Each slot has its own digital display, and from pressing the slot “number” during a function, you can monitor the status of the battery. It features internal protection circuitry, to guard against overcharge and over-discharge. There’s also short circuit protection, temperature control and “zero voltage” activation functionality. 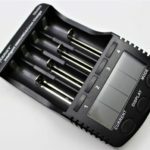 The types of batteries it can charge is the usual long list of lithium-ion’s, plus NiMH. 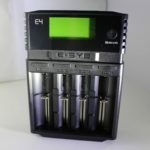 It cannot charge LiFePO4 cells. 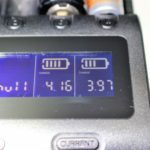 Different battery types can be charged simultaneously. You can choose from four charging currents; 300mA, 500mA, 700 and 1000mA. 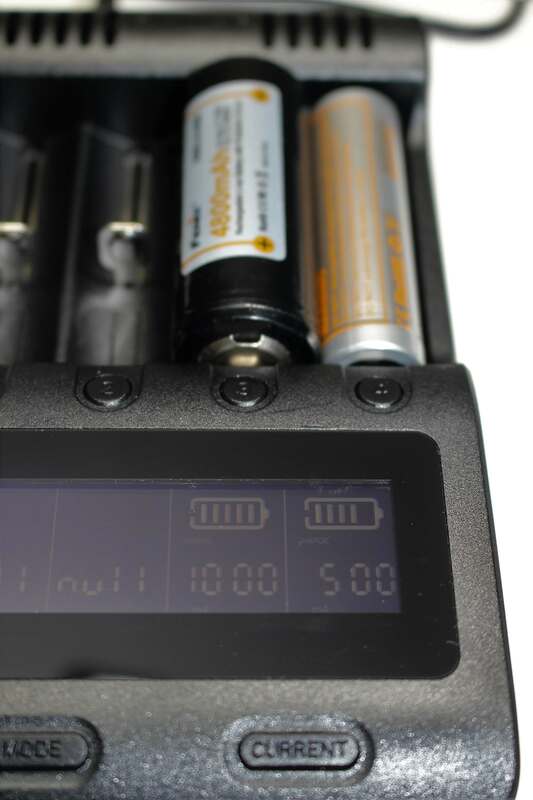 To discharge batteries, you can choose from either 300 or 500mA. Okay, this should be pretty self-explanatory. 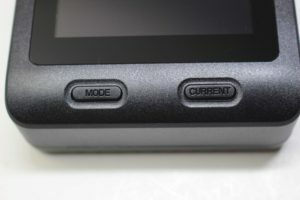 With “charge” selected to a corresponding slot, the battery IN the slot, will charge. Lithium cells charge to 4.2v and NiMH, to 1.48v. You can accept the default current, or select the one you want. If THIS function is selected, the corresponding batteries will DISCHARGE from their current state, then charge to completion. Once the “test” is finished, the display will show battery capacity in mAh. You can accept the default discharging current, or change it if you wish. 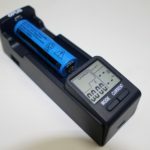 While “Fast Test” gives a quick result as to battery capacity, this function stands for “NORMAL” whereby it does it performs a complete charge-discharge-charge cycle. This type of cycle is standard on most chargers that measure capacity. 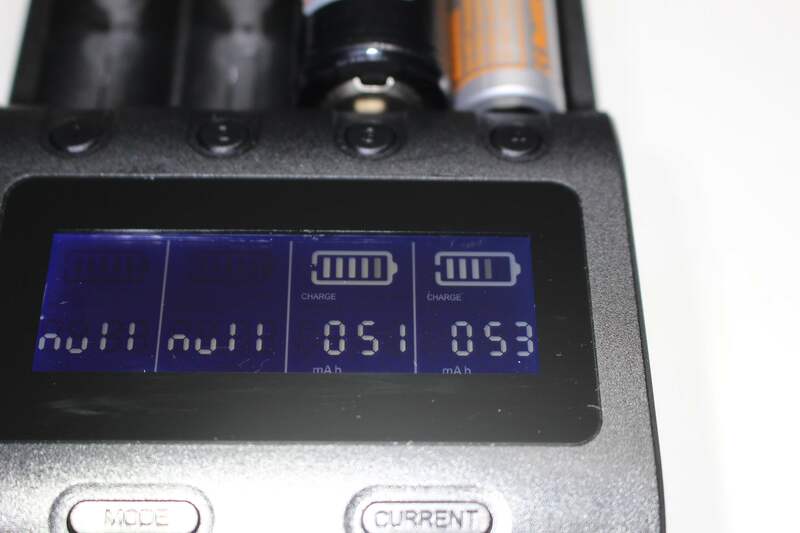 It will of course display battery capacity when the final charge is complete. You can accept the default discharging current, or select the one you want. 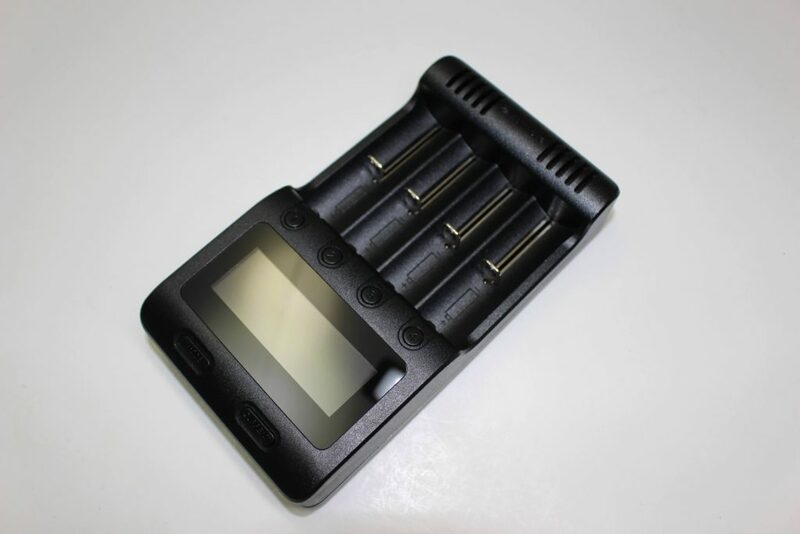 Insert up to four batteries into the slots of the Zanflare C4. Unlike most other chargers, they actually go in upside down… with the positive end toward you. With each battery, the corresponding display will flash. The default function is “charge” so if you don’t press any buttons, the unit will begin charging at 500mA. If you want a different function, press the MODE button. If you desire a different charging current, press the CURRENT button. The cool thing about the C4, is if you decide to change functions after the process has started, you can do so by pressing and HOLDING the “slot button”. This will cause the battery charging icon to flash, at which time you can select a different function AND a different current as well! 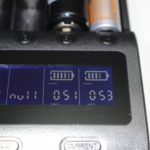 Once a function has started, pressing the “slot button”will toggle to show you voltage, charging (or discharging) current, elapsed time, accumulated capacity and internal resistance. The display doesn’t have a default reading, so you can leave it on any status you want, and it’ll stay there until finished. The display dims after 30 seconds but is still readable. Once the cycle is complete, “END” will blink within the display, while the final voltage takes center stage. “End” is actually quite hard to see, since it’s written VERY small! 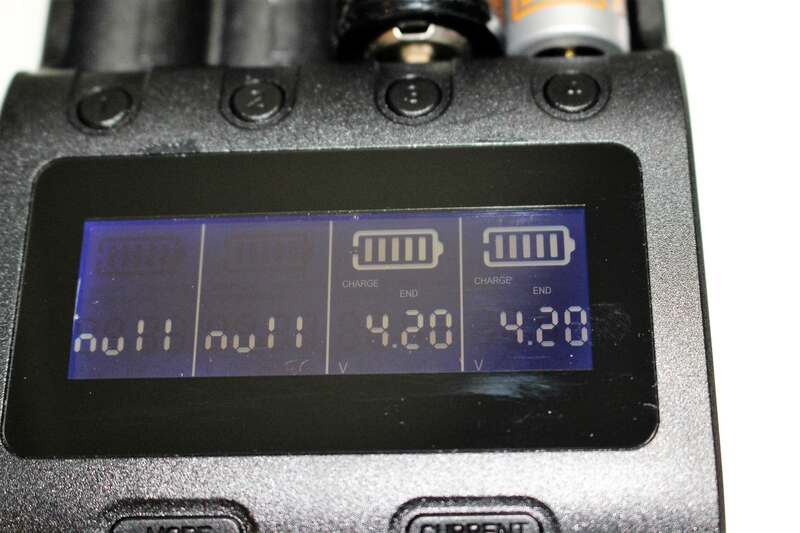 And while it DOES show the ending voltage, it’s one of those chargers that defaults to 4.2 (for lithium). The “actual” voltage will usually be a bit lower. So in my opinion, displaying the volts the way it does, is somewhat counter-productive. In my opinion (and that’s the only one you’re gonna get here)… the Zanflare C4 is a useful charger. It certainly has the most useful functions any charger can have. Of course there are positives, and negatives., but not THAT many negatives which would cause me to not recommend it. 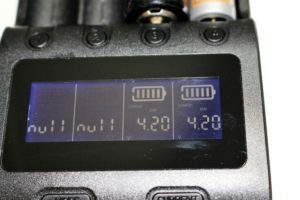 With some chargers, such as the Opus BT-C3100, or the MiBoxer C4, the display, when showing charging “current” fluctuates (as current does) especially as the battery nears capacity. On the Zanflare C4, you won’t see that visual fluctuation. The current WILL be doing that, but the DISPLAY only shows the constant value; i.e. 500mA. I like the flexibility of the unit, but the act of placing the batteries in the slots the opposite way of other chargers, takes a bit of getting used to. 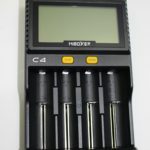 Considering everything, I’m recommending the C4 as being a quality unit with very good functionality. The Zanflare C4 was supplied for test and review by GearBest. I invite you to visit them where you can get the C4 at a very competitive price. 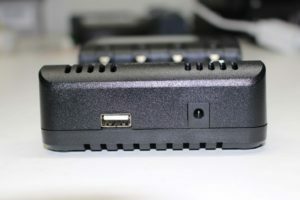 This sounds like it’s almost identical to the Lii 500 charger including the battery positioning. 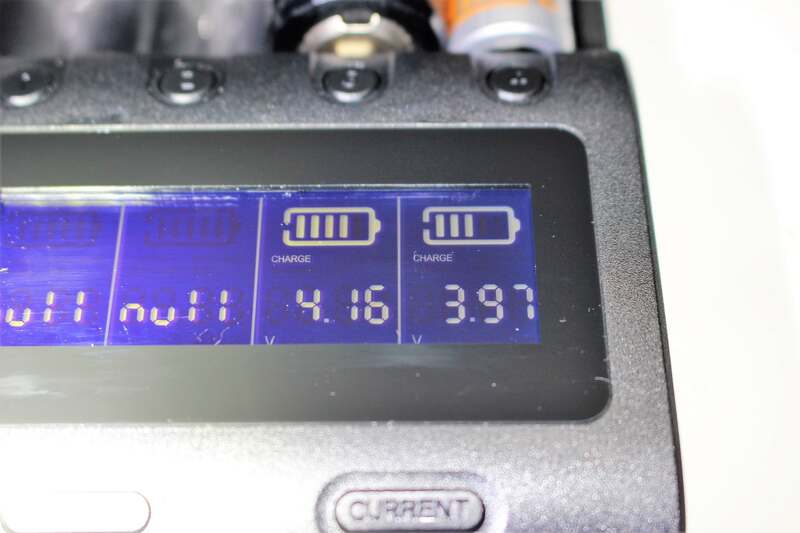 I bought that unit just because of the extra features for battery analysis. I’m not familiar with the Lii charger, but I believe your statement as to their similarity. These days, it’s not uncommon to find different brands sharing product design and features. The only thing I can to say that, is it’s up to the consumer to check them thoroughly before purchase. Imitation has always been the sincerest form of flattery, but when it comes to electronics, you need to be wary if some are merely CHEAP imitations, which lack the quality of the original.